An interesting look into the minds of (de)Generation Y, and how the world is perceived through the eyes of a young one. It's wonderfully easy to find issues of the class come alive in this piece: beautifully constructed in this digital artwork; darkened, to echo the hopelessness that many young people are faced with today, but with elements of hope that we refuse to let go of. 'Cause, dammit, we're rebels in the face of adversity, and we'll fix it yet. The artist, one Hjalmar Wahlin of Stockholm, demonstrates the hierarchy of Western Europe: the corporations that ultimately hold all the power sitting above us, followed by a (seemingly) untouchable monarchy and state. The middle-class "with their wine and fancy glasses" (wonderfully put) look up lovingly at their royal family (a recent poll comes to mind with a large majority of the British middle-class naming Queen Elizabeth II as the person they most admire). Below them, the workers and labourers, with a small percentage moving up. And finally, tadpoles crawling over each other in some attempt to move up in life - perhaps, the competitive nature that is instilled in our younger generations at an early age, the out-for-myself spirit, that we feel is necessary to succeed in a drastically detached society? 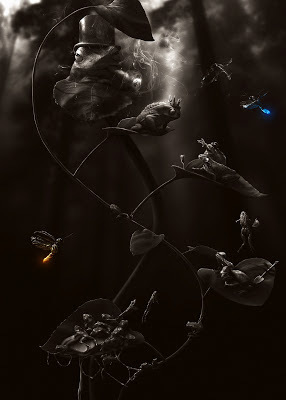 The piece is aptly named Hierarchy of the Frogs, and to see more of Hjalmar's work just click.